Woodlore® is a strong, long-lasting wood-composite product, consisting of a Medium Density Fibreboard (MDF) core. This is a material made from millions of tiny wood fibres pressed together with polymers under high heat and pressure. 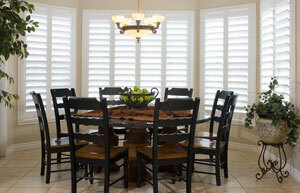 This process results in extremely strong, durable shutters, even more hardy than those made of solid wood. 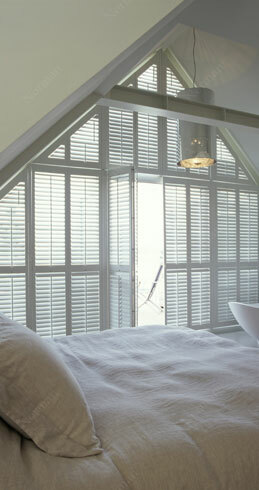 Woodlore® shutters are available in a selection of classic colours, as well as a variety of custom design options. The UV-inhibitors used on Woodlore® shutters protect against colour-fading and yellowing, and their patented polymer coating also resists staining. 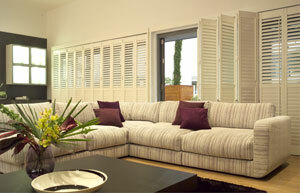 Because Woodlore® shutters are made of a solid composite-wood core, they are much sturdier than hollow vinyl products. The surface coating is extremely durable and robust, resistant to cracking or chipping, making these shutters ideal for use in desert or coastal regions. These shutters withstand temperatures of up to 60° C, so they won’t sag over time, and are highly warp-resistant, unlike vinyl and PVC shutters. Woodlore® shutters are fully compliant with strict environmental standards. They are made from the wood of rapid-growth plantation trees, and even their protective coatings are environmentally safe, releasing no Volatile Organic Compounds (VOC) into the air. Wood composites like Woodlore® are one of the most eco-friendly materials available, as their production involves very little waste, with up to 95% of every tree utilized.